Women golfers can torque up their swings by limiting their hip turns. 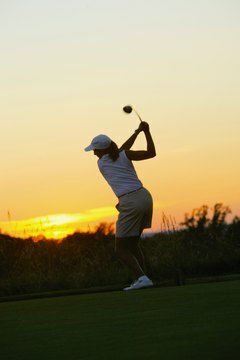 Increasing power and distance can help almost any woman’s golf game and give her a huge advantage over her competition. Crank up the power off the tee with the driver and you will be able to hit shorter irons into greens, setting you up for better scoring chances. One way to increase the power potential in your golf swing is to wind your upper body like a spring against the resistance of your lower body. To wind the spring and build torque, you can limit your hip turn going back by making a few adjustments and practicing a couple of drills. Set up with your back foot at a right angle to the target line. A square back foot limits how much your hips can turn in the backswing. This adjustment will help you feel your hips resisting as you turn your shoulders on the way back. Turn your shoulders before your hips start to move. In a sequenced swing with a limited hip turn, your lower body should be the last part of your body to get pulled into your backswing. The less the lower body moves, the more torque you will create. Ground your front heel. Lifting the heel will loosen the hip turn and cost your torque. Force that heel to stay on the ground if you want to wind up going back. Maintain the flex in your right knee. 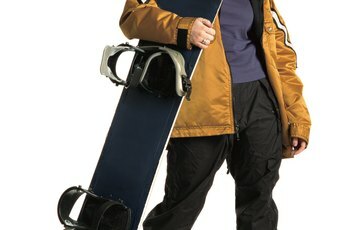 Most people need to straighten their right knee to allow their hip to turn. Holding the flex will limit hip motion and increase your windup. Turn your hips twice as much as you turn your shoulders. The difference in the amount of shoulder versus hip turn provides the torque and swing power. 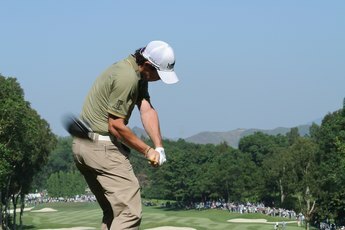 Practice your turn while holding a club across your shoulders behind your neck. Try to stretch your shoulder turn as far as possible while forcing your hips to stay as motionless as possible. Condition your torso for a better turn. Sit on an inflatable exercise ball while holding a broomstick across the back of your shoulders. Keep your back upright and turn your torso as far as you can in each direction. Turn 10 to 15 times in each direction. From the seated position, your won’t be able to move your hips. This exercise will increase the mobility you need for a restricted hip turn swing. Stretch your lower back to increase your ability to turn while restricting your hips. Sit on the floor with your legs straight in front or you, then cross your right leg over your left. Turn you upper body toward the crossed leg while using your left arm for leverage against your right knee. Hold for 30 seconds and repeat on the other side. "Golf Digest" fitness editor Ron Kapriske warns that restricting hip turn on the backswing requires strong core muscles and plenty of flexibility. Otherwise, you risk injury to your back and hips. If you have a weakness in your lower back, pelvis, shoulders or midsection, you should start a golf conditioning program before trying this swing. Otherwise, you might be better off with a less physically stressful approach. 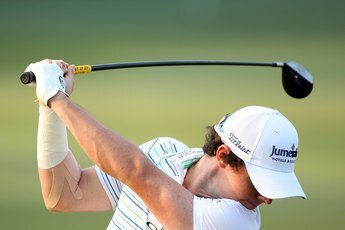 Golf Digest: Fitness Friday: Is the X-Factor Swing Good For You?